Acute myocardial infarction (AMI) is a life-threatening disease, and its incidence has been increasing even in the young population. Although a low eicosapentaenoic acid (EPA)–arachidonic acid (AA) ratio is associated with an increased risk of coronary artery disease, the effect of age on EPA/AA ratios in AMI patients remains unclear. 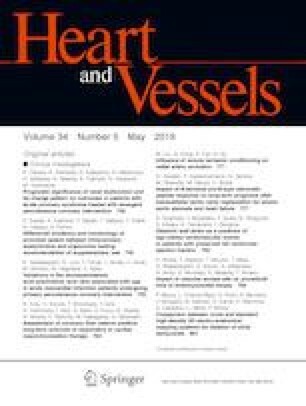 This study aimed to clarify the independent polyunsaturated fatty acid (PUFA)-related determinants of age in younger and older AMI patients. A total of 153 consecutive patients who underwent primary percutaneous coronary interventions (PCIs) for de novo AMIs were enrolled in this study. Patients’ background data, including PUFA and lipid profiles during PCI, were evaluated retrospectively. The EPA/AA ratio correlated positively with age (r = 0.21; P = 0.011) and increased markedly from age 60 years. Patients aged < 60 years (n = 35) had a lower mean EPA/AA ratio (0.25 ± 0.16) than patients aged ≥ 60 years (n = 118) (0.38 ± 0.25) (P < 0.001). The AA level was more dependent on age than on EPA level (r = − 0.34, P < 0.001 vs. r = 0.12, P = 0.16). The multivariate analysis revealed that a 0.1 EPA/AA ratio increase (odds ratio 1.50; 95% confidence interval 1.09–2.06), body mass index, triglyceride level, and aspirin administration were independently associated with the age stratification of AMI patients. The EPA/AA ratio was higher in younger AMI patients who have undergone primary PCIs than in older patients. Younger population at risk for AMI should be managed with multiple interventions including PUFA profiling. The research presented in this manuscript was carried out at Nishiarai Heart Center Hospital, 1-12-8 Nishiarai-honcho, Adachi-ku, Tokyo, Japan 123-0845. This study was registered at the University Hospital Information Network Clinical Trials Registry (UMIN-CTR) with the identifier UMIN000031893. https://upload.umin.ac.jp/cgi-open-bin/ctr_e/ctr_view.cgi?recptno=R000036412. The online version of this article ( https://doi.org/10.1007/s00380-018-1302-6) contains supplementary material, which is available to authorized users. We would like to thank Editage (http://www.editage.jp) for English language editing. This study was not supported financially by any company, grant, or fund.